Heat olive oil in a large pan over medium-high heat. Saute onions until soft, about 5 minutes. Stir in squash, rosemary, garlic, salt and pepper. Remove from heat and set aside. Whisk eggs and milk together in a small bowl. Pour over squash mixture. Mix well. 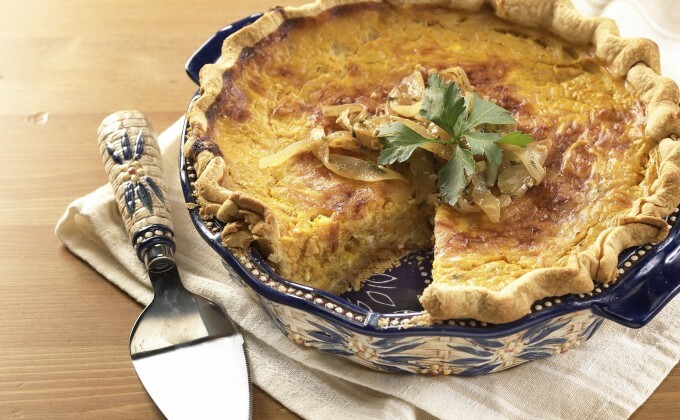 To assemble quiche, please pie crust in the bottom of a pie plate. Crimp the edges and prick the bottom with a fork. Sprinkle 1/3 of the cheese around the bottom. Top with squash mixture. Spread evenly. Top with the remaining cheese. Bake for 40 minutes or until golden and bubbling.